With Tavares Martin Jr. having been dismissed from the program and Isaiah Johnson-Mack having expressed his desire to transfer, WSU will be without its starting outside receivers for the Holiday Bowl. 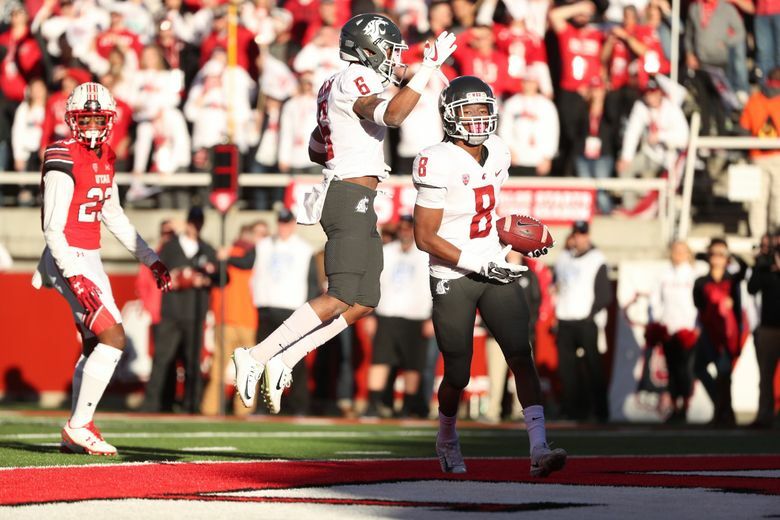 Washington State will likely play Michigan State in the Holiday Bowl on Dec. 28 without its two leading receivers. A week after Z receiver Isaiah Johnson-Mack announced that he’s leaving WSU, the Cougars’ leading receiver, Tavares Martin Jr., been dismissed from the program, the player and the school confirmed Sunday. WSU athletic department spokesperson Bill Stevens said Sunday that Martin Jr. has been dismissed for a violation of team rules, but declined to specify what rules he broke. Martin tweeted in response that he was dismissed because he asked for his release from the program. “I never knew me asking for my release was a violation of team rules,” Martin Jr. said in the tweet. Leach told reporters after practice Sunday that Martin Jr. was dismissed before he requested his release. “I cut him,” Leach said. Martin Jr. served a one-game suspension for the Colorado game on Oct. 21 because, according to his father, Tavares Martin Sr., he lost his temper at his teammates after the Cougars’ loss to Cal. Two different sources with knowledge of the situation told The Seattle Times Sunday that while Martin Jr. did lose his temper in the locker room after the Cal game, he was suspended for the Colorado game primarily for missing a team activity, and was, at the time, warned that if he missed team activities again, he would be cut. Toward the end of November, Martin Jr. again missed a team activity, and that ultimately led to his dismissal, sources said. The receiver’s father said Sunday that his son overslept and missed a meeting two weeks ago, but that Martin Jr. had already requested his release prior to this incident. “He came in late. I called him right before and woke up him, and he wound up taking off (for the football building) and when he got to school, his locker was already cleaned out,” Martin Sr. said. This news came a week after Johnson-Mack tweeted that he has decided to leave WSU to transfer to a program in Florida because he wants to be closer to his two children. Johnson-Mack, a sophomore, later claimed that WSU coach Mike Leach had refused to grant him his release, and was supposed to meet with Leach on Friday to resolve the issue. The meeting had to be rescheduled because Leach’s flight back to Pullman was delayed due to weather on Friday. Martin Sr. says his son’s decision to leave WSU did not happen overnight. He decided about three weeks ago that he wanted to transfer. Tension has been building between the receiver and certain coaches for a while, Martin Sr. said. It dates back to last season, when, after the Holiday Bowl loss to Minnesota, Martin Jr. first told his father that he wanted to leave WSU. “When he left the bowl game, his intention was not to go back,” Martin Sr. said. However, Martin Sr. counseled his son and persuaded him to stick it out. Looking back now, Martin Sr. says he wishes he’d allowed his son to go through with his desire to transfer at the end of last season. Martin Sr. said his son was told that he wouldn’t be allowed to transfer to any Division I football program in Florida. Martin Jr. led WSU in receiving yards (831), receiving touchdowns (9) and receptions (70) this season, and started 11 games at X receiver. He was named an Associated Press All-Pac-12 second team selection last week. Johnson-Mack started every game at Z receiver and finished the regular season as WSU’s second-leading receiver, with 555 yards and five touchdowns on 60 receptions. Johnson-Mack and Martin Jr. are roommates and were former high school teammates at Dwyer High in Belle Glade, Fla. Per The Spokesman-Review, Leach confirmed Saturday that Johnson-Mack will not play in the Holiday Bowl, and the sophomore receiver is also not currently practicing with the team. Martin Sr. said his son and Johnson-Mack are planning to pack up their stuff and embark on the drive back to Florida on Monday. Without Martin and Johnson-Mack, the Cougars will likely go with freshman Tay Martin (no relation) as the starting X receiver against Michigan State, and sophomore Dezmon Patmon as the starting Z receiver. Leach said after practice Sunday that the Cougars are also experimenting with moving Jamire Calvin and Brandon Arconado from inside to outside receiver. I was dismissed from the team because I asked for my release. I never knew me asking for my release was a violation of the team rules.